Peter and Nelly Block brought their daughters, Lea and Tabea, to Baltimore last summer hoping for the seemingly impossible from a Johns Hopkins medical team. This is their story. Peter Block pushes a finger into the tiny fist of his daughter Tabea, eliciting a grin. She smiles at everyone, he says. Next to him, his wife, Nelly, leans over Tabea's identical twin sister, Lea, whom they call the more active one. Lea laughs and Tabea's blue eyes look up, seemingly searching past her forehead for the source of the familiar laugh, the face she cannot see. "They are two different babies," says Nelly. But in one undeniable way, they are not. Lea and Tabea Block are conjoined twins, physically connected by an incomplete splitting of the single fertilized egg that gave them life 10 months earlier. And they are the rarest kind of conjoined twins, craniopagus, joined at the head, which occurs only once in every 2 million live births. Their parents have brought them here to the Johns Hopkins Children's Center, thousands of miles from their small village in northwest Germany, to be separated. Months earlier, their neurologist, Tillman Polster, had sent Hopkins pediatric neurosurgeon Ben Carson sonograms of the twins while they were still in their mother's womb. Deeply religious, the young couple hadn't considered terminating the pregnancy. But they had learned about the poor prognosis of craniopagus twins — without surgery, most don't live past their second birthday. They had also learned of Carson, who in 1987 gained worldwide recognition as the first surgeon to successfully separate craniopagus twins, Patrick and Benjamin Binder, with both surviving. A decade later, he traveled to South Africa, where he led the successful separation of 11-month-old Zambian twin boys also joined at the head. Like the Block twins, the boys shared intricate blood vessels flowing into and draining within each child's brain. They also presented the same surgical dilemma: how to successfully separate this elaborate vascular network. Carson looked at the Block babies' sonograms, and then at imaging studies after the twins were born. He understood why there was talk in Germany that separation was not possible. But he also believed it was. The choice was not an easy one for the parents. In previous surgeries, typically one twin would die, sometimes both; those who survived usually suffered some brain damage. On the other hand, staying connected meant they would never be independently mobile, and they would face a host of potentially fatal health problems, including blood clots, infections, and pulmonary embolisms. The couple chose separation. 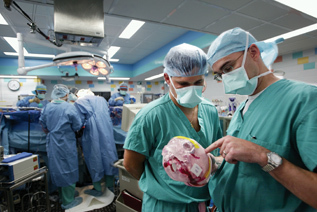 Neurosurgeons Ira Garonzik, left, and Richard Clatterbuck familiarize themselves with landmarks on an acrylic model of the twins' shared skull. The Blocks had arrived on June 1 with Polster, who encouraged the 100-member medical team to meet the twins before their procedures, to see them as kids, not as a medical phenomenon. They did, streaming through a neurosurgery conference room to say hello to the family and to explain their roles leading up to the September separation and in the surgery itself. The few team members who had participated in the Binder separation 17 years earlier knew what to expect, though they also knew that each case was different. But for the rest, this was truly a new experience. "The first time you see these little kids, it's strange," says neuroradiologist Philippe Gailloud. "They're cute, they play with you, they're absolutely normal. But they are joined." The meeting was also a chance for the parents to learn about the pre-operative procedures the twins would undergo over the summer — imaging studies, the insertion of tissue expanders beneath their scalps, and weekly injections of saline to grow new skin needed to close their surgical wounds after separation. In ways, the threads of a unique partnership had begun to take hold, not only between the parents and the team, but among the team members themselves. But only after the surgery would they fully comprehend the clinical challenge they would face, the experience they would share. It is a cool morning on the Johns Hopkins medical campus, quiet but for the muffled sounds of a few construction workers on scaffolds encircling the hospital's trademark dome. Inside the hospital, in Ben Carson's eighth-floor office, things are anything but subdued. He and a dozen other neurosurgeons are going over their game plan one more time, with the surgery less than an hour away. "There are always surprises," Carson says. The idea is to minimize them, by reviewing and re-reviewing the films, knowing the anatomy — sticking it to your brain — and repeatedly going over each surgical team's part in the operation. Indeed, as Carson explained at practice runs over the preceding two weeks, the surgery would involve 11 intricate steps — each one ranging from one to five hours, each one more difficult than the previous step. First the plastic surgeons, led by Rick Redett, would make an incision in the scalp along the plane of the twins' connection at the top of their heads, remove the tissue expanders, and expose the skulls, which neurosurgeons would then open to expose the brains. Vascular neurosurgeons like Rafael Tamargo would then begin dividing the twins' blood drainage, or venous, system — a complex network of arteries, veins, and tiny capillaries that carry vital nutrients like oxygen to the brain. Imaging scans months earlier had produced a hemodynamic portrait of this network, revealing which way the rivers and tributaries flowed, where to divide to give each child adequate circulation. But these veins and vessels were not freestanding strands you could grab with a surgical tool. Like threads in a blanket, they were embedded within pockets, or sinuses, of the dura, the millimeters-thin leathery sack covering the brain. Knowing how much and where to cut was critical. Next, Carson and the neurosurgeons would begin to tease apart the two brains, which were distinct but pressing hard against each other. They would have to deftly nudge the gelatinous gray matter apart without cutting or tearing tissue, which could damage brain cells. Back and forth the teams would go, hours at a time, dividing gray matter and dura until they had complete separation. Then the plastic surgeons would face the daunting task of closing two gaping surgical wounds and reconstructing half a cranium for each child. All in all, the operation would take some 30 hours, says Carson, who likens it to "defusing a time bomb." The girls' brains, pressed tightly together like two Jell-O molds, share a complex network of arteries, veins, and tiny capillaries that will need to be painstakingly divided before surgeons can begin to tease apart the two brains — a process neurosurgeon Cliff Solomon likens to removing "a stamp from an envelope without taking any of the envelope." While Carson and the neurosurgeons meet, Redett is with his team, using acrylic models of the twins' skulls and simulated polyurethane skin to rehearse their cuts one more time. Similarly, pediatric anesthesiologist Deborah Schwengel and her group are going over their strategies to manage vital signs and minimize blood loss. The previous day they had prepared the girls for their surgery, inserting breathing tubes, as well as central lines to monitor blood pressure, heart rate, and lung function. They placed intravascular catheters to deliver medicine and transfuse blood rapidly, and to withdraw it to measure electrolytes and the blood's ability to coagulate. Their tasks would not be made any easier by the twins' shared blood circulation — medicine they gave to one could cross over to the other — nor by the physical rotations of the twins needed to give surgeons access to different areas of the brains. Body movements could change blood pressures, IV lines could get tangled. "The fact that it's a 360-degree operation makes it that much more difficult to watch everything," Schwengel says. In the OR itself, Mary Helen Winter and other surgical nurses are checking their instruments, which circulating nurses will supply to the scrub nurses to pass on to the surgeons. Winter was primed, having played the procedure over and over in her mind during her drive in at 5 a.m.: "I don't get nervous," she would say later. "Anything that's very challenging, I'm like, 'Bring it on.'" "You can't go into something like this with a pessimistic attitude," Carson says. "If you're going to do that, you may as well stay out of it." Maiyappan Solaiyappan helped develop a "virtual workbench" that allows neurosurgeons to see the girls' brains as a three-dimensional, manipulable object. A surgical simulator of sorts, it enabled Ben Carson and his colleagues to physically navigate beforehand the precise environment they would face in surgery. "Not having this is like being in Manhattan without a map," says Carson. But there is a guarded attitude, too. Do the familiar, what has worked before. Be deliberate, but be wary, too. Schwengel, among others, is certainly in that frame of mind, and for good reason. When anesthesiologists had tilted Tabea's feet up the day before to raise her declining blood pressure, it dropped even more. Apparently, some of the increased volume meant for Tabea's heart had flowed into Lea. Then, the next morning, Tabea's hands and feet felt inexplicably cool, and fluid had collected in her chest overnight. Was it blood, which could postpone the operation, or IV fluid from a catheter, perhaps jostled out of a vein as the babies were being moved? It turned out to be the latter, a pleural effusion, and 200 CCs of saline were drained from Tabea's chest. Putting the events together, Schwengel later says, "Maybe something was up that we didn't quite understand. We proceeded, but with a great deal of care and vigilance." The twins are rolled into OR 12 amid a sea of bright blue and green scrubs, yellow and pink tiles, silver IV poles, clear plastic tubing, and black wires and cables. Some two dozen physicians and OR nurses, adorned with strips of tape designating which child they are responsible for — orange for Tabea and yellow for Lea — fill the room. They step back as the twins are lowered onto a bed tailor-made for this type of surgery. Like the twins, it is one but two, separable — by the pull of a pin — only after the twins themselves are separated. At its midpoint are two headrests, but the bulk of each side is a cushioned clamshell that will encapsulate each twin, allowing them to be turned in unison to give surgeons access to all regions of their brains. The team had planned to use "holders" who would turn the twins in their arms, but Schwengel had learned about this so-called rotisserie bed just three weeks earlier from anesthesiologists at Children's Hospital of Dallas. 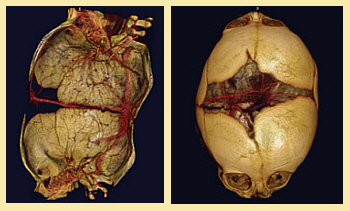 Throughout the surgery, neurosurgeons like Donlin Long refer to images of the twins' brains. Carson said the bed would shave four hours off the operation and provide greater stability when the twins were turned. But it required a metal halo to be connected to the twins' skulls and locked to the bed. For Winter and the other nurses, the bed posed draping and sterility issues. For the anesthesiologists, the challenge was how to conduct a cardiac arrest code on a patient cocooned inside a shell. With the twins in the bed, plastic surgeons Redett and Craig Vander Kolk examine the six softball-size bubbles, the tissue expanders, protruding from the shared scalp. The new skin shows no signs of erosion or rupture — risks that could stop the surgery — and there appears to be more than enough tissue to cover each skull. The surgeons begin to shave strands of blond hair from the stretched scalp, maneuvering small electric razors around the bubbles like slalom skiers negotiating moguls. Finished, Redett gently flexes each sphere of new skin, then watches it jiggle to confirm its strength. "That's Redett. Only he would have the courage to do that," jokes pediatric anesthesiologist Eric Jackson, watching the operation from a small auditorium in the Minimally Invasive Surgery Center five floors above the OR. With its two large video screens and three rows of stadium-theater seating, it now serves as an observation and break room, a place for team members to grab a bite, relax, and follow the surgery between OR shifts. As the plastic surgeons prep the twins' scalps, Alexa Drubay, the hospital's interpreter for the parents, walks into the observation room. Since June she has been their eyes and ears at Hopkins, escorting them to appointments and translating what the physicians saw. But she went beyond her job, helping Nelly and Peter Block rent a van and find a temporary apartment in the Baltimore suburbs, hosting a birthday party when the twins celebrated their first birthday on August 9. Like other team members, she had often cited the Blocks' calm in the face of this storm. But this morning, after leaving them across the street in the Children's House, which provides housing for families traveling long distances to Hopkins, she wears a worried look. The parents are concerned about the fluid in Tabea's chest, the delay. Drubay sighs, "They're glad now everything is proceeding." 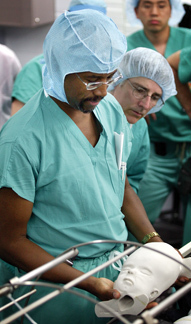 Neurosurgeons Rafael Tamargo, left, and Ben Carson prepare to begin dividing the twins' brain tissue and shared blood vessels. A moment later, Carol James, team coordinator and senior physician assistant in pediatric neurosurgery, pops her head into the observation room. She has been at the hospital since 5:30 a.m. Now, looking at the screen and the plastic surgeons struggling with the halo, she says, "We knew this would be a marathon." At 12:30 p.m., five hours after the operation had begun, Redett makes the first incision, a long S cut along the contours of the tissue expanders. He and Vander Kolk then carefully peel back the scalp, revealing six transparent sacs. They place the pouches on top of the scalp, roll the new tissue back over them, and suture them in place to reduce recoil and shrinkage. As they finish at 2:30 p.m., the whirl of small drills fills the room — neurosurgeons goosing the motors, getting ready for the craniotomy. "We're ready to open the window," Ben Carson says at 3:50 p.m. Another voice is heard: "We're making up major time." And yet another: "We could have separate babies by 1 a.m." Working over the plane, the line of the planned separation, Carson and neurosurgery chief Henry Brem begin to dissect pieces of periosteum, the fibrous layer covering the skull. Over the next hour they turn flaps of the pinkish tissue over, revealing white bone. They then begin to drill and carve out a one-inch band around the skull, except for a small section at the back of the twins' heads that will support their exposed brains. Other neurosurgeons rub wax against the edges of the cut bone to reduce the risk of air being sucked into vessels in the skull, which could send potentially fatal air embolisms to the heart. Anesthesiologists counter this risk with a Doppler on each chest to detect the millwheel murmur of air bubbles in the heart. If need be, they'll flood the heart with fluids to push any air out. At 3:50 p.m., Carson asks the team of vascular neurosurgeons to come down, adding, "We're ready to open the window" to the brains. Another voice is heard: "We're making up major time." And yet another: "We could have separate babies by 1 a.m."
Up in the observation room, Tamargo, Alex Olivi, and Richard Clatterbuck bounce off their seats toward the door. Within minutes they are in the OR, delicately cutting across the dura. Like mine sweepers, they run a pen-size Doppler probe back and forth over the membrane to detect unseen draining vessels and predict their tortuous course. Millimeter by millimeter they open the window, closing in on the anterior sinus. There's a whoosh-like sound from the Doppler, then another, and another. They've hit the first section of draining vessels to divide. The OR is quiet as Tamargo replaces his scalpel with long, tweezer-like pliers. "They're cutting across the sinus," whispers Brem. "If this goes well, you'll begin to see the opening, the divide [between the two brains]." 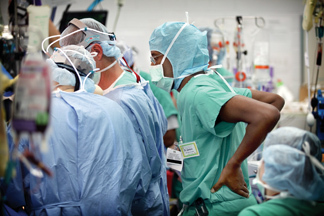 The mood in the OR is cautious but confident as surgery progresses. Squeezing the pliers, Tamargo cuts into the dura, leaving a tiny horseshoe clip at the same time as blood begins to ooze out, then another to seal the now-separated vessel. Using an electric scalpel to cut vessels won't work in the very sticky endothelial tissue within the dura. The vessels tend to shrink back when cauterized, increasing the risk of an infarction, a stroke. 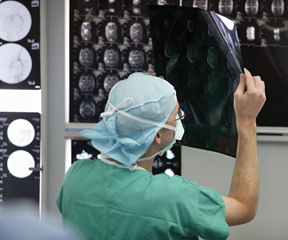 This cutting across veins and vessels is what neurosurgeons usually avoid at all costs. But here it is mandatory, and the risks literally ooze out in front of them. Infants with little blood volume like these twins could bleed out in 30 seconds. And multiple transfusions can lead to a nightmarish scenario in which the blood loses the ability to coagulate. The more the anesthesiologists transfuse, the more they dilute the clotting factor, the more the patients bleed, the more they have to transfuse. For now, bleeding appears under control as the vascular neurosurgeons continue over the next hour to clip small channels crossing their path, dividing the dura over the plane. As risky as this step is, it's less perilous than tackling what's ahead of them. Normally, a large vessel called the superior sagittal sinus runs over the top of the brain, front to back, to provide drainage. But the twins' shared drainage vein splays off into two branches that feed into a larger circular vessel. It looks like a peace sign. The surgeons must divide this network, cutting into straw-size vessels that pose a much greater risk of bleeding than the smaller channels within the dura. Worse, surgeons know from imaging that at the bottom of the peace symbol, at the back of the skull, is the basal dural sinus, which contains the torcula, the crossroads for this circular sinus. In the twins, it is actually two fused torculas, appearing in imaging scans as a pool of tangled vessels that the surgeons must separate. "The lake," they call it. But how do you divide a lake? For now, it is hidden by the remaining piece of bone, waiting for them. "It was a good idea to not play cowboy and keep on going with the surgery," says surgical nurse Mary Helen Winter. "They both could have died." At 6 p.m., Carson and neurosurgeon Donlin Long step in to help divide the anterior sinus. They begin to go deeper into the divide, then stop and decide to first rotate the table to remove the remaining piece of bone. That will give them better access to the sinus, but it will also put them perilously close to the torculas earlier than planned. "We're 3 centimeters away," says Olivi as he cuts through periosteum sticking to the bone. "We'll have a quick end to this operation if we bite that torcula," says Long. A week earlier in his office, Long was optimistic these twins could be safely separated. In the 1987 Binder operation, which he and Carson led, the twins' shared superior sagittal sinus was one vessel, which meant a wall had to be constructed to give a vein to each child. There was a huge risk of catastrophic blood loss. But this time, because of the circular drainage system the Block twins shared, no walls would have to be built. The risk of blood loss was still serious, but lower. "This looks a lot more favorable," Long had said. Indeed, the mood in the OR as the neurosurgeons close in on the final piece of bone at 7:15 p.m. is cautious but confident. Blood loss has been less than expected, the twins' vital signs — for now — look good, and the team is way ahead of schedule. "Looks like we'll get to bed tonight after all," says Long. Neurosurgeons Paul Wang, left, Ben Carson, and Henry Brem wait while anesthesiologists try to revive Tabea following her arrests on the first day of surgery. Then, like that, at 7:45 p.m., everything changes. Tabea is in cardiac arrest. 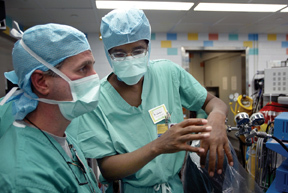 "Surgeons away from the table," says pediatric anesthesiologist Eric Jackson. Immediately the neurosurgeons lift their arms and step back as anesthesiologists rush in. Two of them hold the endotracheal tubes on Tabea's clamshell as circulating nurse Courtney Campbell cuts the drapes and removes the clamshell — just as rehearsed. 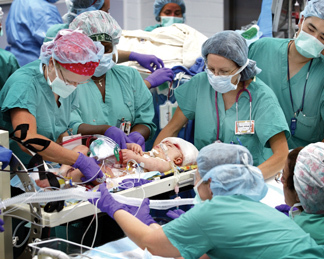 As Jackson begins to administer CPR, pediatric neurosurgeon George Jallo holds the halo to make sure it doesn't pop off during the repeated compressions. Jackson asks for a stool, then for complete silence in the OR so he can hear Schwengel tell him what she sees on the monitor. They're getting perfusion — blood through the heart to organs in the body — with the chest compressions. But there's still no electrical impulse, no heart beat. Racing against the clock, they use a defibrillator to shock the heart. It starts beating, but erratically in ventricular tachycardia. Jackson continues CPR as Schwengel injects an anti-arrhythmic. They shock Tabea again. This time they get a normal heart beat with blood pressure. The heart's ventricles are pumping blood on their own. A sigh of relief in the OR. But then, 15 minutes later, Tabea arrests again. Again the anesthesiologists race to resuscitate her, and again, within minutes, they revive her heart. Now, in the OR, the anesthesiologists tell the neurosurgeons it is time to say goodnight and give Tabea's heart some time to rest. The surgeons, citing concerns about increased scarring, swelling of brain tissue, and shrinkage of scalp, are inclined to keep the twins in the OR until it is safe to continue. But in short order, they all agree it's best to give the twins a longer break in intensive care. "It was a good idea to not play cowboy and keep on going with the surgery. They both could have died," Winter would later say, adding, "Of course, we didn't know what kind of jeopardy they would be in if we didn't continue." When Tabea arrested the first time, Drubay had called Peter and Nelly Block. Tabea is not doing well, she told them. The surgery has been stopped, Tabea is stable but in critical condition, and the girls are being moved to the pediatric intensive care unit. At daybreak the next morning, the distraught couple arrives at the PICU, where they find the twins under anesthesia, bandaged, bruised, and swollen from the surgery. They stroke the girls' arms and legs, sing to them in German. Then, through Drubay, they start asking questions: Was this comalike state damaging their brains? How were their hearts? What had caused Tabea's arrest? No, Schwengel answers, the twins should do fine under anesthesia until the operation resumes. The bad news is that Lea had apparently developed a pulmonary edema overnight from fluid buildup in her lungs. When IV fluids were given to Tabea to raise her blood pressure and counter the arrest, some of it may have crossed over to Lea, raising fluid levels in her lungs. Had the surgery continued, Lea's condition would have likely worsened. Time in the PICU would help. Rafael Tamargo, left, and Alex Olivi use the electronic operating microscope to get a better look at vessels within the dura they must divide. Indeed, later on Sunday Jackson would report that Lea's lungs look "pristine." Tabea's heart, however, is still functioning poorly, and what triggered the arrest during the surgery is still unclear. The anesthesiologists had known that an arrest was at hand five minutes before it happened. Tabea's EKG waves, indicators of how well her heart was contracting, told them that. Also, as the surgeons finished dividing the anterior sinus, the blood pressure in both brains, called the central venous pressure, had immediately doubled. Why? One explanation was that the division of the sinus had altered the shared drainage system. Certain off ramps that served to shunt blood flow through this vascular highway had been shut down, backing up traffic, increasing blood volume back to the heart, triggering the arrest. "All of this drainage that was going through the head all of a sudden was prevented from bypassing and stopped," Jackson would later say. "The volume was so tremendous that the heart, temporarily, was not able to deal with it." But, Jackson would add, it was just a theory. Another one, according to Schwengel, was that an electrolyte disturbance had been caused by low levels of calcium in Tabea's blood: "When you give more blood, you dilute out and bind some of the calcium. The heart is sensitive to that, and Tabea's was particularly sensitive." Regardless of the cause, throughout the day on Sunday, Tabea's heart continues to decline into left ventricular dysfunction, a prelude to congestive heart failure — a condition that not only threatens Tabea but her twin sister, too. If Tabea were to die before separation, toxins would build up in her blood and circulate to Lea, leaving her only hours to live. So dire is the situation that Schwengel calls Jackson and Myron Yaster at noon on Sunday. Stay close to home, she tells her fellow anesthesiologists. The team might have to perform an emergency separation that afternoon — one of the issues that team members had discussed weeks earlier. "We would have to decide if there was a point at which we would stop," Schwengel later explains, "and say one patient has to be sacrificed for the other." As it turns out, Tabea, thanks to medicines that help her heart contract more easily, makes it through the day. In fact, over the next two days, echocardiograms show her heart getting stronger. The team grows optimistic that they can resume surgery in another day or two and still safely separate the twins. But following Tabea's arrests, the concern over one or both children dying is palpable. 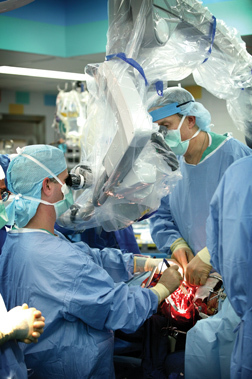 Team members know they are only halfway through, that the twins have hours of open brain surgery to endure, including the most difficult part. They will stay with the plan, but, if possible, move even more deliberately. Time, they sense, is not on their side. Minutes after nurses close the clamshell on each twin, Redett and Vander Kolk open the scalp and remove the tissue expanders. Right away they realize they've lost about 40 percent of new skin to shrinkage over the past three days. The flaps they had planned with their models would not be possible; skin-grafting surgeries would likely be necessary down the road. 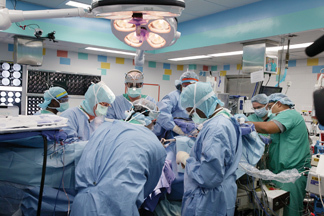 At 10 a.m., the neurosurgeons step in and rotate the bed to remove the remaining piece of bone. "Everybody's vitals okay? Everybody happy?" Schwengel asks the other anesthesiologists. An hour later the last piece of bone is detached; the bony bridge bonding the two twins has been taken down. Now the neurosurgeons can concentrate on dividing the remaining sinuses and tissues connecting the two brains. Schwengel walks into the break room, hands raised, fingers crossed. "So far, so good," she says. "They're about to enter that big vascular complex." Everyone knows she's talking about the basal dural sinus and the two torculas it contains, the crossroads of the twins' shared blood drainage system. Again, Tamargo and Clatterbuck run the pen-size Doppler probe over the dura to detect vessels, then cut and clip them at the same time. But they seem more cautious than the first day, repeatedly referring to diagrams that scrub nurses place on the clamshells, then pointing with their silver instruments into the brilliant pink field, discussing alternate approaches. At noon, they bring in portable ultrasound so they can see, as well as hear, the vessels. 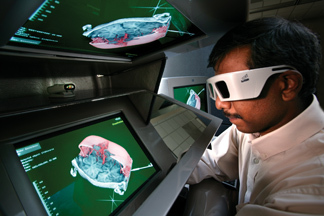 Carson and Olivi leave the table to look at the anatomy of the twins' brains in 3-D on the virtual workbench in the adjacent OR. They return and consult with Tamargo and Clatterbuck. Then the discussion stops, leaving only the whoosh-whoosh sounds of the Doppler and suction as the vascular neurosurgeons suture, rather than clip, one of the vessels. Then they quickly move on, snipping and clipping a pathway through the dura. 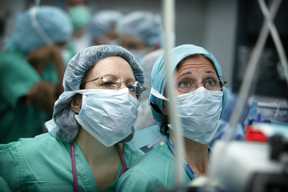 Pediatric anesthesiologists Deborah Schwengel and Eugenie Heitmiller closely monitor the twins' vital signs just before separation. "We're four or five millimeters from the [basal dural] sinus," Clatterbuck says. About the same time, Drubay walks into the observation room. The translator has just left the parents in the Children's House, praying. Nelly was working on an embroidery of puppies, Peter on a wood etching of a ship, both for the twins' room back home in Germany. "The day they each hold a baby in their arms," says Drubay, "what a wonderful feeling that will be." As the surgery proceeds, Tamargo and Clatterbuck encounter a lot of bleeding as they begin to divide the torculas. It is a pyramid-like structure, they realize, and they're at the base. Cutting here may mean severe, possibly uncontrollable bleeding. At 2 p.m., they decide to rotate the beds and come down from the tip of the pyramid. That proves a better approach with less bleeding. But an hour later they step out so Carson and Cliff Solomon, a neurosurgeon who trained at Hopkins, can begin to tease the two brains apart to give the vascular surgeons even better access. Though Tamargo and Clatterbuck's work is unfinished, Olivi acknowledges their progress with high-fives as they walk into the break room. In the OR, celebration is the last thing on Carson's mind. The two brains, like two molds of Jell-O, press hard against each other — they're more stuck than the surgeons had anticipated. There's a line of demarcation, but at places the tissue is intertwined by wispy fibers of connective tissue called arachnoid. Normally, these spider-web strands tether the dura to the surface of the brain; now they connect two distinct brains. Over the next three hours the neurosurgeons meticulously cut through the arachnoid as they work their way down the plane, placing strip after strip of Gelfoam — gauze-like material soaked in coagulants to minimize bleeding — as they use clamps and probes to delicately push and pull the two brains apart. They're constantly aware that cutting more than a millimeter deep into the tissue could injure brain cells critical for neuronal function. "It's like trying to remove a stamp from an envelope without taking any of the envelope," says Solomon. At 5 p.m., the vascular team returns to the table to again take on the torculas. The mood in the room is optimistic. The surgeons are moving ahead, seeing what they had anticipated. "It's reassuring to see the mental plans we had made were correct interpretations of their structures," says Tamargo. "Surgically, things couldn't be going better." Indeed, the word in the break room is the twins might be completely separated by 9 p.m. At 6:45 p.m., Solomon is even more optimistic, predicting separation within an hour or two as he watches Carson pull the electronic operating microscope over the field to go even deeper into the divide. An hour later, at 7:45 p.m., Solomon and the other observers see what Carson sees — clips put in earlier on the other side of the brain. They are close. But again it is slow-going, meticulous work as one area of the plane is even more compressed. As quickly as the neurosurgeons separate gray matter, the tissues swell and push into each other again. They know they'll have to begin, inch by inch, to pull the two beds apart to keep the tissues separated. Pediatric anesthesiology fellow Jamie Schwartz, left, and Schwengel prepare to hand off Lea to the waiting hands of OR nurses. At 9 p.m., that time comes. There is silence in the OR, a gasp in the observation room, as the team moves the two beds ever so slightly apart. A moment later, all seems well as the vascular team enters the OR to continue dividing the final sinus. But at 10 p.m., both rooms go quiet — someone's in trouble. This time it's Lea, her heart rate declining as her blood pressure goes up. Schwengel, suspecting the symptoms are temporary and triggered by pressure on the brainstem, asks the neurosurgeons what they're touching. Moments later Lea's heart rate and blood pressure stabilize, and at 10:20 p.m., the team again pulls the beds an inch apart, two clicks. At 10:40 p.m., Clatterbuck reports "a fair amount of bleeding," and Tabea's heart rate drops ominously. The waves on the monitor don't look normal, not even for a troubled heart. Schwengel and the other anesthesiologists work to stabilize Tabea, while the neurosurgeons try to get at the source of the bleeding. They need to act fast, or one or both of the girls may not make it. At 11 p.m., they rotate the bed again, another two clicks. Clatterbuck continues dividing the sinus. At 11:20 p.m., Carson, concerned about the twins, leans over his shoulder. "Okay, can we do it? We've got to move. We've got to get them apart." At 11:30 p.m., another voice: "Quiet, please." Then Carson's, "Alex, let's move it just one inch." Olivi answers, "Okay, ready." And again, the bed shakes slightly. "Okay, that's it. More irrigation," says Olivi. Then Tamargo reaches into the divide, probing with his fingers for any remaining segments of the sinus that need to be cut. The neurosurgeons are in full emergency mode, trying to do in 30 minutes or less what they'd prefer to do over two hours. Then, at 11:45 p.m., they hear what they knew was coming, what they were hoping against. 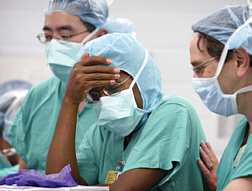 "Unplug, we're flat," says anesthesiologist Dolores Njoku, telling the surgeons to step aside. Again, Lea is in trouble. OR nurse Campbell starts cutting the drapes, then, just as quickly, stops when Njoku says, "We're okay." But the twins are hardly out of the woods. One concern is replaced by another. "We're trying to keep the bleeding down," says Carson. "We're going to take them apart." Nurses and surgeons position themselves around the beds as Carson adds, "We're just going to extract about two inches, then dissect the rest of the way." There's quiet again. A moment later, at 12:05 a.m., the beds move apart ever so slightly. "Keep pushing," Carson says as Tamargo again reaches in to separate any remaining tissues. At 12:10 a.m., the beds are moved apart again. The twins are separate. "Okay, we're apart," says Schwengel. "Let's go. Unplug everything." There's applause in the observation room as the beds roll apart and turn 90 degrees, taking two separate teams with them. But there's no cheering in the OR as anesthesiologists begin to unscrew the clamshell on Tabea's bed. Campbell again steps in to cut the drapes and removes the clamshell. "Prepare for CPR, get the defibrillator over here," says Yaster, as he begins compressing Tabea's chest. Ten feet away, surgeons and anesthesiologists converge on Lea's bed. Her blood pressure has declined significantly, while her CVP, the blood pressure in her brain, has risen to dangerous levels, stressing her heart. Tamargo and Olivi, who is now on his knees to better access the back of Lea's brain, feverishly suture veins and dural tissue torn during the emergency separation. "We're starting to get control [of bleeding] again," says Olivi. Meanwhile, over Tabea's bed, a voice is heard: "Everyone back. We're shocking. Everybody clear." Tabea's tiny body flutters and Jackson steps in, taking over CPR from Yaster. "Do we have a rhythm?" Jackson asks. "No," a voice answers. "It's not working. It's still not working." Jackson switches to adult CPR, placing one hand over the other to apply more pressure on Tabea's heart. Then Yaster comes in again, then Jackson, switching every few minutes. They continue for 20 minutes, 40 minutes, 60 minutes, but to no effect. There is only the slightest sign of electrical activity in her heart, and no pulse. They cease CPR. They cannot save Tabea. Lea's scalp has been closed and her head bandaged, but she is hardly out of the woods. The epinephrine Schwengel injected earlier has stabilized Lea's stressed heart, but now she is in a state of extreme hypertension. "We could have lost her," Schwengel would later say. "Absolutely." At about 2 a.m., as Lea is taken to the PICU to recover, James walks out of the observation room and down the hallway toward the elevators. She stops to talk to a woman, one of the nutrition staff who had been preparing meals for team members during breaks. "We have a beautiful little girl," James tells her. She hugs her, adding, "Let's hope she stays healthy." In the early morning hours, PICU nurses bathe and dress Tabea's body, then take plaster impressions of her hands and feet, which they do for parents after a child has died. Just before daybreak, Peter and Nelly Block walk into Tabea's room with Drubay and Polster to say goodbye. Moments later, they head down the hallway to Lea's room. For Rick Redett, there was little time for thinking about the separation. Already he was planning the skin-grafting surgery that would completely close Lea's scalp. In the operation a week later, he would try a new device — a gastro-intestinal stapler designed to seal bowel — to seal his dural patch. It worked, he later reported, preventing any leakage of cerebral spinal fluid. But for many of those who treated the twins, the days and weeks that followed became a time of reflection — how did I feel, what did I learn, what did I walk away with? Peter and Nelly Block returned home to Germany with Lea on December 6. 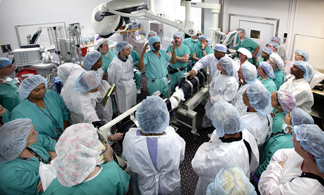 Several of the surgeons viewed the surgery as a learning experience for future separations. "A lot of younger guys are learning a lot, pushing on to the next border, which is how progress is made," says Carson, who has talked about creating a center of excellence for craniopagus twins at Johns Hopkins. "We all act as stepping stones." Tamargo was already diving deeper into the literature to better understand the unique biological system of craniopagus twins in the hopes of finding better ways to divide them. Clatterbuck, too, would use the experience as fuel to investigate new ways to improve care for these patients. He hadn't quite gotten over the loss, though, partly because he lived near the family over the summer and often saw the parents pushing the twins in their stroller. "Seeing them day to day cemented in my mind their humanity, the fact that they were a family, the struggles they were going through," he says. "I still have a hard time finding final closure." Many of the team members attended bereavement sessions at Harriet Lane Compassionate Care, the Children's Center's palliative care service, where they were able to express their feelings of loss and reassure themselves they did everything they could. At one of the sessions, Drubay recalled how Peter and Nelly prayed together and developed a rhythm in taking care of the twins, picking them up together and moving calmly as if in a slow dance. "I'm not a religious person, but I witnessed how Peter and Nelly gained strength and courage through their faith, how the power of teamwork and spirituality can help with loss." Winter says she found comfort "in knowing a lot of intelligent people in that room did everything they could to save" the twins. "I can accept the fact that you've worked very hard and you're not God." After the surgery she did go for a long sail on the Chesapeake Bay. "And yes," she adds, "I do now look at my kids with more amazement and wonder." Carol James took some time off but found herself waking up at 2 a.m. every morning, staring at the ceiling, thinking about the twins. She didn't start sleeping well, she says, until she returned to work. Reconnecting with Peter and Nelly Block — watching them leave for Tabea's funeral in Germany and return again to Lea — made her realize what was still left to do. "There was a new life to take care of," she says. Scrub tech Juliet Robinson, who had been passing instruments to surgeons as they fiercely tried to stem the bleeding in Tabea's skull during her final arrest, had a similar reaction. "Once they stopped, I felt a sigh of relief because she no longer had to suffer," Robinson says. "The way I look at it, one child had to pass, so Tabea said, 'Okay, I'll be at rest, but you go on now, Lea. Now it's your turn. You live.'" Following separation, Lea Block underwent six additional operations to relieve swelling in her brain, begin rebuilding her cranium, and completely close her scalp. She will have more surgeries at around age 5, when her skull has grown enough to allow bone-grafting reconstruction. Until then, she may wear a helmet to protect her brain. Lea has other issues to face as well. The emergency mode the team went into at the end of the surgery saved Lea's life, but it also resulted in some damage to her brain, particularly the occipital cortex. Consequently, she has suffered some vision loss, though it's too early to say how much, as well as the loss of some fine motor control of her arms and legs, and she has weakness on the left side of her body. The ability of different parts of an infant's brain to take over the function of damaged areas, known as plasticity, may allow Lea to recover some of these functions, but likely not her impaired vision. In early November Lea was discharged from the hospital and joined her parents at the Children's House, where she continued to receive occupational and physical therapy. On December 1, in a pediatric neurosurgery conference room, members of the team said goodbye to Lea, Nelly, and Peter. On December 6, before leaving for the airport, the parents stopped to see plastic surgeon Rick Redett one more time. They knew, from their weekly visits to him over the summer, that he too had twins, 4 1/2-year-old girls. "Give your twins our love," Peter told him. Then the Block family flew home to Germany. Gary Logan is associate director of communications and public affairs at Johns Hopkins Children's Center. His short story "Fells Point" captured the 2004 Best Short Fiction award from the Maryland Writers Association.